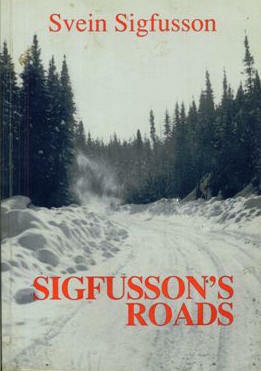 THE BOOK SIGFUSSON'S ROADS IS WHAT I CALL THE BIBLE OF CAT TRAINS AND WINTER ROADS. IT IS A VERY GOOD BOOK AND ENJOY READING IT OVER AND OVER. LOTS OF DETAILS WHICH MAKE IT ENJOYABLE TO READ AND A FEW PICTURES TOO. THE BEST WAY TO BUY THE BOOK IS DO A SEARCH ON THE INTERNET FOR THE BEST PRICE AND AVAILABILITY ALSO THE FRONT COVER HAS BEEN CHANGED TO A DIFFERENT PICTURE.